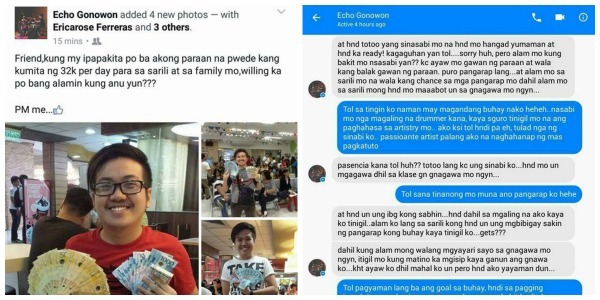 MANILA, Philippines - A man working for a network marketing company has earned the ire of netizens after his conversation with a prospective downline recently went viral. A certain Ma Kristina Metran Catudio shared screenshots of a lengthy conversation between her brother and Echo Gonowon on her Facebook page. The post amassed over 10,000 shares and more than 8,000 reactions. Apparently, Gonowon was trying to convince Catudio’s brother to join his network marketing company in order to earn more money. But after Catudio’s brother politely declined Gonowon’s offer, the latter began insulting his prospective downline. “Tol naniniwala akong effective ang networking, kaso hindi ako nabibilang sa may mga kaloob na lumago jan tulad mo eh, mahina ako sa networking… Passionate artist pa lang ako na naghahanap pa ng mas pagkatuto. Wala pa ako sa paghahangad ng kayamanan,” Catudio’s brother told Gonowon. In an attempt to persuade his prospective downline, Gonowon even bragged that he was able to purchase a house and lot worth P1.5 million through networking. According to him, Catudio’s brother wouldn’t be able to purchase such thing with his income as an employee. He continued giving derogatory remarks saying that Catudio’s brother is living a difficult life because he doesn’t have a vehicle or a decent home. Frustrated that he wasn't able to convince his prospective downline, Gonowon even went to the extent of claiming that Catudio’s brother can’t afford to buy a nice pair of shoes. Read the complete conversation below. Shortly of Catudio’s post went viral, Gonowon once again contacted his prospective downline. Here’s the second part of their conversation. Also known as multilevel marketing (MLM), network marketing is a popular business strategy utilized by several companies in the Philippines. In recent years, such business strategy has gained notoriety over the manner members recruit their downlines. Moreover, some fraudulent companies have also tainted the reputation of MLM in the country.